The president of Peru has declared 2017 El año de buen servicio al ciudadano. That means, the year of good service to the citizens. With my Interpol document in hand (see Becoming Peruvian Part 1), along with several other documents, we celebrated Thanksgiving by applying for citizenship. 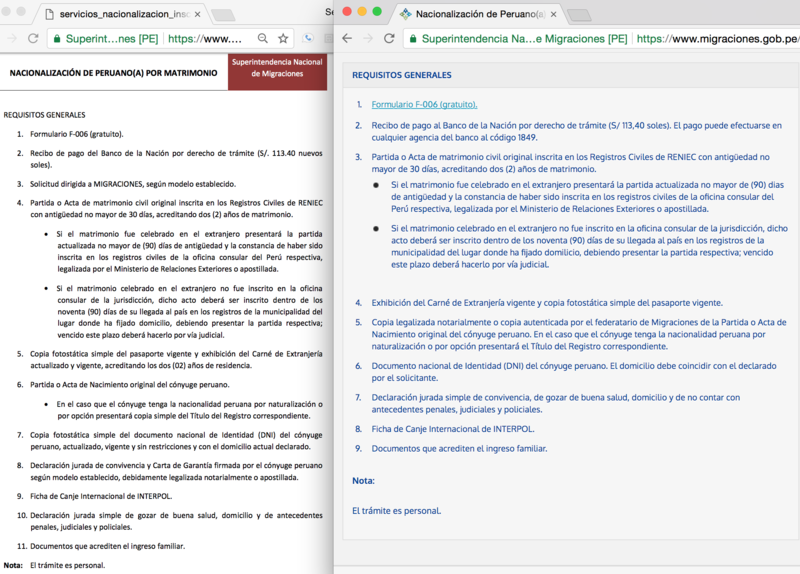 To make life easier, Migraciones Peru publishes a document on its website listing the documents that you will need in order to apply for citizenship. As a matter of fact, they publish two lists, two different lists. They also do not answer their phones. We decided to go with the easier list knowing that public services in Peru are trying to make things easier. It is, after all, the year of good service. We arrived at Migraciones at 10:45 AM ready for our 11:00 appointment; the taxi ride there took about 45 minutes. They received our documents at about 11:15 and called me in at about 11:35; Ana Maria could not come in, yet. In a cramped office with three desks, an office that also acts as a passageway to additional offices, I met with a kind woman who took her work seriously. At the desk next to us another woman sang along with her headphones; she quieted down when we began talking. My marriage certificate had a second last name, my mother’s maiden name, but that name did not appear on any other document, so I have to prove that I am the same person in all of the documents and that my mom is my mom- rest in peace, mom. Conversation ended, I went downstairs to figure out how I could make corrections to my official entries and departures list. (While I did that, Ana Maria officially cancelled the appointment we just had so we did not lose the money we paid for the appointment- it was nice we could do that.) Turns out Migraciones had three different names for me: with and without my middle name, with and without my mom’s maiden name, and with an additional last name of Ley. Who knew? We performed the necessary paperwork to join all three records together. Now my first entry into Peru is listed as 1996. At least I think it has been changed- they would not show me the change on the computer screen. By the way, I still have no personal documents with my mom’s maiden name. The part about certifying Ana Maria’s official certificate requires no comment. What could I possibly add to certifying an official certificate? It only requires 10 working days and a return trip to RENIEC. As for the marriage license, back in 2000 when we married, the official filling out the paperwork for the marriage license insisted in putting a second last name. Both Ana Maria and I protested because I have no document that has my mom’s maiden name. The official really insisted and added the name from my birth certificate. Now we have to request the original paperwork from the town where the civil ceremony was held… which is easier than requesting a birth certificate from Minnesota. If all of this takes longer than a month I will have to begin again at INTERPOL because that document is about to expire. I think our official copy of the marriage certificate already expired; it’s only valid for one month. A big thanks to Ana Maria who has done most of the work to get me citizenship! Happy Thanksgiving!! The president of Peru has declared 2017 El año de buen servicio al ciudadano. That means, the year of good service to the citizens. What might a year of bad service look like? Part one began a little over a month ago when I went to Interpol, the International Police here in Lima. To apply for citizenship I need a document saying that I am not a fugitive wanted for illegal activity in any country. We got in line at 7:00 AM ready for the 8:00 AM opening, the wrong line. Thankfully Ana Maria found the correct line after asking many people and receiving contradictory information. After waiting, getting fingerprinted, waiting, having my teeth checked, waiting, filling out the forms again because the forms we picked up before had changed and also needed to be filled out in a different color, we were finished. We left. Finally, I picked up the Interpol document after showing a picture of my US passport that I had on my phone. I had been told to bring my Peruvian ID (CE) because no one in Peru would request a US passport for a Peruvian document. Nope, that was wrong- no one except Interpol. This only took two hours- 1.5 hours in the wrong line and 30 minutes in the correct one. This document is valid for three months so on my next day off from school I went to Migraciones to apply for citizenship. How hard could it be? when someone’s on the swing. but hear the lunch-bell ring. and she gives ten minutes more. and Rob blames me for punching Pete. Teach’ knows I never fight. with cookies like no other. rough edges that I had. Is not rather old nor is hardly that new. New wall-to-wall windows that close with a click. of the bathroom to assure me that nothing is leaking. I realize then ’tis my knees that are creaking. “Let’s talk of it,” she softly cried. “Um, I just did,” the man replied.